Easter is just around the corner and while we are looking forward to the festivities, let's take some time to think about our pets' safety. Just like Christmas, Easter brings an abundance of food to our homes and tables and it is not always easy stopping our pets getting wind of it. Easter flower arrangements, bright decorations and baskets of sweet treats adorning the home are exciting for pets who will naturally want to get involved in the celebrations. While the want to indulge our animals in the same way we indulge ourselves is natural, overfeeding or feeding the wrong things can be very harmful. Nobody wants an impromptu visit to animal emergency because their dog or cat has consumed something toxic! So, what are the foods to avoid this Easter? Being aware of what your pets are ingesting is a year-round priority, but during festivities when food is everywhere and family and friends (who might not know the ground rules when it comes to what your pets can eat) are enjoying your hospitality, the need to keep tabs on what your animals are enjoying is especially important. It will come as no surprise that chocolate is the number one food to avoid your pet getting its paws on this Easter, as no celebration attracts more of it than this one. Easter eggs, bunnies, cakes, and other seasonal treats are made of the stuff and while we can’t get enough of it, our pets can fare very badly if they consume even a small amount. Chocolate contains Theobromine, a chemical that can elevate the heart rate of dogs and cause vomiting, diarrhoea and potentially fatal seizures. Dark chocolate is the worst offender as it contains the most cocoa and unsweetened baking chocolate is the most toxic of all. Keep all chocolate out of reach of pets and make sure youngsters are aware of the dangers of sharing their edible goods with animal friends. Other seasonal foods to be mindful of are those containing the sugar substitute, Xylitol. This sweetener is harmless to humans and is found in a number of baked goods, sweets and chewing gums. The chemical can cause problems to pets if consumed in very large quantities. In small quantities, it is safe and has actually been approved for use in cats and dogs under the Catalogue of Feed Materials European Commission Directive. You'll often find it listed as an ingredient in pet dental products for its antibacterial properties. If baking with dough, make sure it is kept well away from animals as yeast will rise whether in an oven or your dog’s digestive tract, which can be potentially fatal. Like Christmas pudding, Easter fruit cake contains a large number of raisins which are harmful to both cats and dogs. Grapes and raisins bear a potent toxin that does not agree with pets, posing a threat to liver and kidney functions. Raisins don’t exactly scream Easter but they do feature in traditional Easter feasts, so make sure these are never in reaching distance of your pet. Not only does fruit cake contain raisins but nuts also frequently appear in the recipe. Again, nuts such as Macadamias contain powerful toxins which can affect a dog’s digestive, muscle and nervous systems, resulting in weakness and breathlessness, tremors and swollen legs. Nuts are also a popular celebratory nibble which are often offered up in bowls to guests and family, in perfect proximity to the hungry mouths of pets. Onions and garlic, whatever their form (raw, cooked or powdered), are also very dangerous to cats and dogs in large quantities. A component present in both foods is responsible for destroying a dog’s red blood cells, a serious condition that can lead to anaemia. Various symptoms signal an anaemic dog such as breathlessness, listlessness, vomiting and general disinterest in life. Onions and garlic are popular seasoning ingredients found in all manner of foods and are likely to feature in meals over the Easter period. Stuffing contains both, so make sure your cat or dog is kept away from it. Garlic is also found in a number of commercial dog foods and treats, and many claim it actually has beneficial properties when administered in small amounts. It all depends on how your dog reacts to it and it is sometimes better to veer on the side of caution. Joints of meat are often roasted wrapped in string and served up for an Easter family meal. This meat is very desirable to cats and dogs who might take advantage of unattended food. If the string (which is usually soaked in tasty meat juices) gets stuck in the throat, the consequences can be fatal. Please ensure that cats and dogs have no access to string and take care when disposing of it. Various other foods have been labelled harmful for pets, although the jury is still out on many of them. Like humans, dogs and cats react differently to foods, with some suffering greater degrees of intolerance or allergic response than others. Most people prefer to adopt the attitude ‘better safe than sorry’ and try to avoid certain foods (i.e. avocado, peaches, plums and persimmons, rhubarb, corn cobs and tomato leaves) where possible. Usually, the majority of human foods are suitable for pets if given rarely, and in very small quantities. Besides food, various other hazards take centre stage around Easter time. Hallmark flowers of the Easter and spring season such as lilies and daffodils, are incredibly poisonous to cats and dogs. If a cat nibbles a lily petal, grooms itself after coming into contact with the pollen, or drinks the water from the vase, it may suffer vomiting, diarrhoea, lethargy and kidney collapse. Similarly, daffodils contain potent chemicals that are harmful to pets when ingested and can cause gastro-intestinal upsets and organ damage. Artifical grass which is often found in Easter baskets or in decorative displays around the home is potentially very dangerous to pets who might ingest it. It may look aesthetically pleasing and signal spring is well and truly here, but for dogs and cats it represents a great play thing to be sniffed at, licked and even eaten. The sharp plastic strips can become lodged in an animal's throat or intestines causing major digestive obstructions. Either limit the use of artificial grass to places your pets can't access it or opt for a safer alternative such as shredded tissue paper. 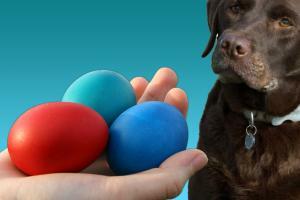 In order to ensure a happy and healthy Easter is had by all, taking care of what your beloved pets are eating over the celebrations and ignoring the temptation to indulge them with potentially harmful human foods, is a sure-fire way of guaranteeing they make a bouncing entry into spring without any unpleasantries. Excellent article, I knew lilies were dangerous to dogs and cats but not to the the degree discussed. Can I give carob from the health food shop to my dogs? Many thanks. Carob is derived from an evergreen shrub and is often substituted for chocolate in recipes. It is also given to dogs as a sweet treat. Carob doesn't contain theobromine, caffeine, phenylethylamine or fromamide, which makes it safer than regular chocolate. The sweet and pleasant flavour makes this a definite hit with dogs! I can concur with the comment about cats ingesting raisins! I'd accidentally dropped 3 on the kitchen floor whilst sprinkling mh cereal with them but it didn't even occur to me that one of my Furry Feline Trio would even CONSIDER consuming them.....how wrong I was! A frantic call to the Out of Hours Vet and a mad dash down to the surgery for Poppy on a Sunday proved to be the best decision....after a emetic-like procedure she produced 3 whole raisins! An anxious 24 hr period whilst she remained under close observation for any potential kidney damage was one of the longest 24 periods ever....thankfully all was well. A vet's bill of almost Â£650, thankfully covered by insurance, was a salient reminder to keep such human delights away from them in future! Pretty sure it's only daffodil bulbs that are toxic to dogs and cats. This doesn't specifically apply to Easter, but I recently had a bad scare when a newly arrived rescue cat ate some leaves off my beautiful Dracaena plant and made herself severely sick for an entire day. Worried calls to the vet disclosed that it wasn't on the poisonous plants list, but was actually toxic to cats, Fortunately the cat recovered and was fine in a couple of days but the Dracaena sadly had to go, so beware if you have one in the house. I am concerned re your onion and garlic comments because the KC breeder who sold us our adorable chocolate lab over 8 years ago, said to keep the fleas at bay she sprinkled garlic powder onto her dogs food. As we have four cats we have to be on top of them at all times. Even though all 5 animals are treated, as well as carpet spray etc, I have periodically sprinkled garlic powder onto her food. Will I have caused any long term damage to her do you think? Giving animals garlic is ok as long as it is in moderation, I make my own liver cake for all my dogs , I add 2-3 cloves of garlic to the ingredients .